I have been making this recipe for Irish Bread Pudding literally since I was a kid – if a teenager is a kid, anyway. I begged the recipe from my friend Cassie’s Mom after I had it at her house. (What kind of kid does that? Maybe I was destined for a food blog even then, although at that time we had our phones hard-wired in and some of us were still on party lines and no one even dreamt of the internet!) It was my first taste ever of bread pudding and it was a revelation. My Mom was a fantastic cook and an exquisite baker but we weren’t big dessert eaters at our house. Luckily she taught me early how to bake, then I had a little “tutelage” from my Grandma (Which didn’t always help – she was famous for saying put in a little bit or a pinch or “add some” of something. “How much?” “Oh, just some,” she’d say.) and then there was 4-H and after-school baking binges with friends. At least until we were all too busy with jobs and activities. But that long rambling dissertation is just summed up by saying that my Mom had certain things she baked for certain occasions and she would sometimes, but not often, try something new. And I don’t think she’d ever thought to have made Irish Bread Pudding. Then for a while, I helped out with dinner when I could but pretty much took over a lot of the baking kind of recipes. And Irish Bread Pudding was one of them. This is a humble, farmhouse style Irish Bread Pudding. It’s nothing like the famous bread puddings that came out of New Orleans, big panfuls of dense, butter, rich bread pudding that’s sliced and served with sauce. Like my White Chocolate and Raspberry Bread Pudding – it has an Amaretto White Chocolate Sauce that’s to die for! This is more of a just make it if you have a little bread, especially if it’s a touch stale, pop it in the oven while dinner is cooking and everyone has a little sumpin’ sumpin’ sweet for dessert. It’s def not a big restaurant style dessert for company. 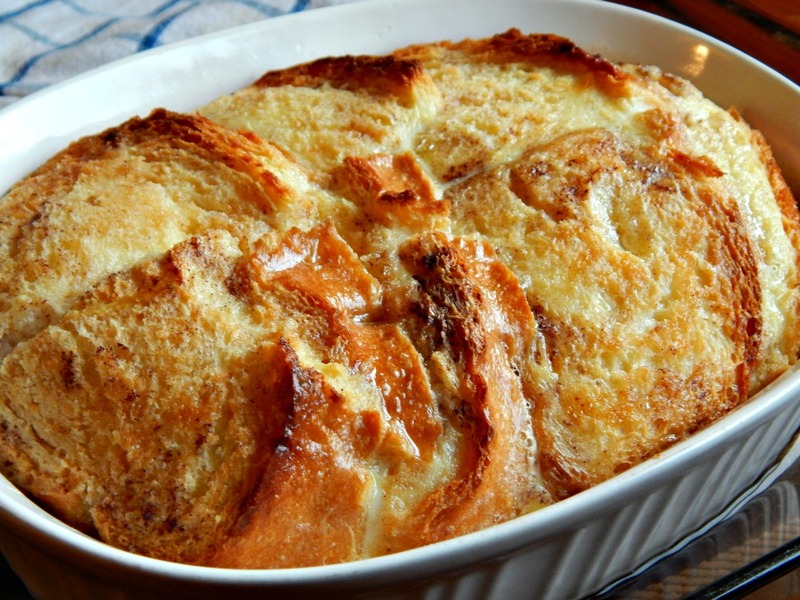 Irish Bread Pudding is sometimes, these days, called Bread & Butter Pudding. It’s layers of lightly toasted bread spread with butter, sprinkled with cinnamon sugar and baked in custard. You can add a few raisins if you’d like, put them under the bread or they get crispy on the top, and yes, if you want, you can add a sauce. Maybe my Rum, Whiskey or Vanilla Sauce. That sauce was ubiquitous when I was growing up and even served in the school cafeteria. I love it made with rum for this Irish Bread Pudding, but just use rum extract or vanilla if you’re worried about the kiddos. When you make Irish Bread Pudding, just use sandwich bread, but a good one and in a pinch any regular old loaf will do. It’s even better with a store bakery soft Italian loaf, hand cut, not too thick, though. Remove the crust if you’d like. You’ll probably notice that the bread pudding is going to puff up and be gorgeous right out of the oven, but then it falls. That’s normal. And you’ll notice that the top, while just a bit crispy, will give way to a soft, custardy center and there will be a little liquid in the bottom of the pan. Technically, today we’d call that “weeping” and it’s probably considered a flaw in the recipe, but you’re gonna want to just spoon that right over the bread pudding when you serve it. It’s delish! Really, it’s almost like it’s own sauce, and the Irish Bread Pudding probably doesn’t even really need the Rum, Whiskey or Vanilla Sauce. I just can’t skip an opportunity to make Rum Sauce, it’s so delish! Older recipes like this always say to “scald” the milk, which means to heat it just below a simmer; you’ll see teensy tiny bubbles right at the edge of the pot and then you’ll remove it from the heat right away. Scalding supposedly aligns the proteins to form a richer custard with less weeping. It also gives the bread pudding just a bit of a jump start in the oven when the warm milk instead of cold is used. I almost always scald when called for though honestly, I’ve fudged it at times, too, and skipped it altogether. I think maybe today’s pasteurized milk makes a difference and makes scalding not as necessary. Irish Bread Pudding (Bread & Butter Pudding) Ready for the oven. This is a fantastic, homey recipe that’s a great way to use up stale or leftover bread. I’d say it serves six to eight modest servings, maybe not what we’re used to today, so keep that in mind. Child number 2, the gluttonous one, can polish off half a pan, easily. Do you have one of those at home? You set something on the counter, walk away a few minutes, come back and it’s gone?? Any leftover bread pudding is great for breakfast, although it will not be as fluffy and will separate more. As a matter of fact, I’ve been known to make this for breakfast – well we’ll just call it brunch, it sounds so much better to serve this for brunch – instead of baked French Toast. Place a pan of water on to boil for a water bath and make sure to have a larger container for your casserole to fit in. Scald milk in a pan on the stove or heat in the microwave. If using the microwave use a large container. Let bread cool, then spread with soft butter, sprinkle with brown sugar, then sprinkle with cinnamon. This is best done with the pieces lined up together tightly on the countertop. Cut each slice into two to three pieces if desired, and place in a buttered casserole, about 1/2 quart size. Sprinkle with raisins between the layers, if using. Mix eggs, sugar, vanilla, and salt. Slowly stir in a little of the hot, scalded milk, whisking constantly, then add all back to the hot milk, still whisking. Pour over the bread in the casserole. You can press down once or twice on the bread, gently, but it is normal for the bread to float to the top. Place casserole dish into a larger pan, carefully add boiling water to the depth halfway up the casserole and place in oven. Bake for 65 to 70 minutes until puffed and golden brown. A knife inserted halfway between center and edge should come out clean. Remove from oven and let cool to just warm before serving. This entry was posted in Click here for Fabulous Food Posts and tagged Bread, bread pudding, Desserts, Eggs, Family Recipe, Heritage Recipe, Irish, leftover bread, milk, Pudding. Bookmark the permalink. Thanks for the link up! Merry Christmas and Happy New Years! French toast taken to a higher level of existence. It looks very tasty indeed.